Get Shorty! On episode 902 of Knitting Daily TV, host Eunny Jang dives into tips and techniques for short-row knitting. Learn four ways to wrap your short rows for clean lines, and learn how to incorporate short-row knitting into your work for cleaner finishing and style. Plus, visit with Shay Pendray and Kristin Omdahl as they crochet an all-seasons hat using broomstick lace and cables. Also on this episode, join Clara Parkes and Eunny in the Knitting Lab with a yarn spotlight on washable wools. On episode 902’s Getting Started segment, Eunny demonstrates unique ways to wrap your short rows. 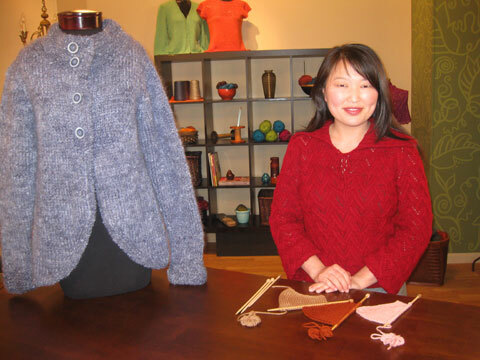 The blue cardigan sweater featured on this episode is the Cutaway Coat by Sandi Rosner, from the the knit.wear 2011 special issue magazine.This cardigan uses short-row knitting not only for fit but also for style along the bottom hem. On this episode’s Accessorize Me! segment, crochet expert Kristin Omdahl joins up with Shay Pendray to demonstrate the Cables and Lace Broomstick crocheted hat, a fun accessory for any weather. 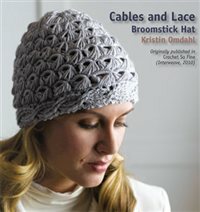 Download the Cables and Lace Broomstick Hat pattern, from Kristin’s book Crochet So Fine and crochet along with Knitting Daily TV. Eunny and Clara meet up again on this episode’s Yarn Spotlight to talk about washable wools. What makes a yarn washable, and what are the best uses for these fibers? Featured on this Yarn Spotlight is The Loopy Ewe’s Solid Series, and also shown are Brown Sheep’s Lambspride Superwash (orange) and Tahki Stacy Charles’ Zara Plus yarn (red). Thank you to our Yarn Spotlight sponsor, The Loopy Ewe. Finally, Eunny wraps up this episode with a quick tip on changing stepped bind-offs into short-row knitting. She demonstrates an example of when this is useful, such as for the shoulders of a sweater. Incorporating short rows into this design will lend to a smoother line and make seaming the shoulders of this sweater both easier and cleaner. The cabled tank shown in this Quick Tip segment is the Reticulated Pullover by Mathew Gnagy featured in Interweave Knits Spring 2012. Don’t get Knitting Daily TV in your area? Get the entire Series 900 of Knitting Daily TV on a 4-Disc DVD Collection! Click here to purchase DVDs and individual episodes of this season or previous seasons of Knitting Daily TV. Holiday Knitting: Ready, Set, Go!